It is with great sadness we are constantly reminded of the imminent demise of South African Airways and the repeated government bailouts. The airline is technically bankrupt and one wonders how long this situation will continue before the company folds completely. South African Airways is one of the world's oldest airlines having been formed in February 1934. The South African Government took over the assets and liabilities of the struggling Union Airways and formed South African Airways. SAA fell under the control of South African Railways and harbours. The importance of air travel had not been realised in those early days the original department left 'Airways' until last in its title. 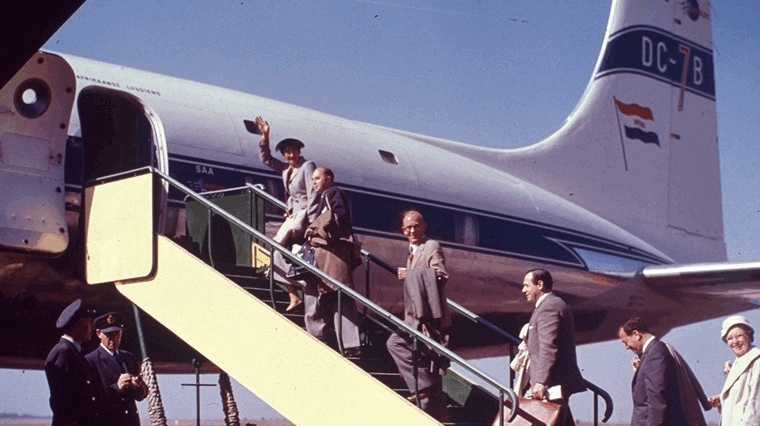 SAA went from strength to strength and in 1945 started its first intercontinental route. The route was from Palmietfontein (then Johannesburg's international airport) to Hurn Airport at Bournemouth in the U.K. Heathrow had not yet been built. The route was via, Nairobi, Khartoum, Cairo and Castel Benito (Tripoli, Lybia) with overnight stops in Nairobi and Cairo. The actual flying time on this route was about 34 hours. In 1950 with the introduction of the Lockheed Constellation, known as the Connie, the total journey time on this route was reduced to 28 hours. The Constellation was the first pressurized aircraft operated by SAA, allowing it to fly higher and get above the storms into smoother air. 1956 saw the introduction of the Douglas DC7B which was the ultimate pre-jet airliner. It was the fastest airliner in the world at the time, and also boasted a respectable range. The performance of this aircraft allowed SAA to introduce a single stop service to the United Kingdom. The journey time was reduced to a mere 21 hours. The DC7B allowed SAA to inaugurate a service to Australia. One of the most significant changes in the history of South African airways history, and airline history as a whole, was the introduction of jet aircraft. There are those who would argue that the change wasn't for the better. 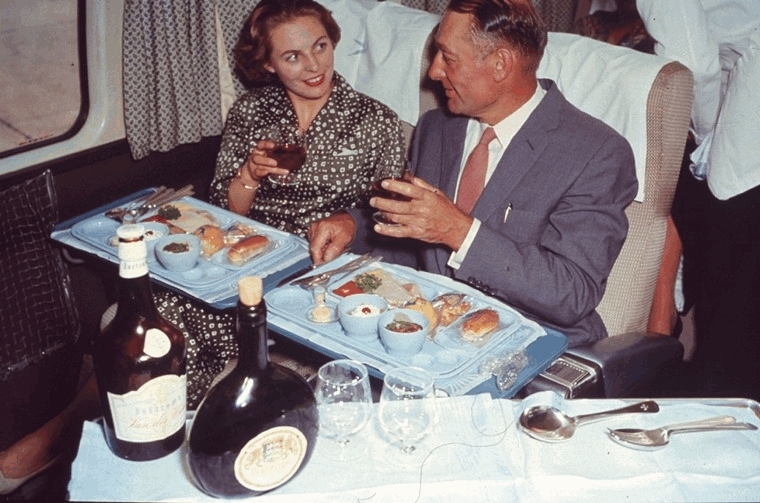 In the old days, air travel was very civilized and relaxed. Aircraft flew at low altitude by today's standards; passengers could enjoy the scenery. Flights to far-off international destinations took days but they would fly during daylight hours and then night stop. Although the Douglas DC7B was the precursor of the jet era, it was the jetliners that really changed the way people travelled on international routes. SAA had, prior to the DC7B, operated two de Havilland Comets leased from BOAC. The Comets were British registered, operated by SAA crew but wore the livery of both BOAC and SAA. The Comet was the world's first jet airliner but in order to achieve the best performance, jet aircraft need to fly at very high altitudes, where the air is too thin to breath. The solution is to pressurize the cabin so that passengers can breathe normally without oxygen masks. Unfortunately, when the Comet was designed, the stress on the airframe due to pressurising and depressurising was not yet fully appreciated. The Comet suffered from structural failures due to metal fatigue and was withdrawn from service. It wasn't until July 1960 that South African Airways started operating the new Boeing 707 long range jet airliner. Although not the first jet airliner, it was without doubt, the first one that was successful and is widely regarded as the aircraft that introduced the jet age. It had four Pratt & Whitney engines housed in pods under the wings. The first 707 to arrive in South Africa was registered ZS-CKC and was named "Johannesburg". SAA aircraft names were themed; all the 707s were named after South African cities. Along with the introduction of the 707, SAA also introduced new livery - the famous orange tail. The aircraft was configured for 139 passengers in 2 classes, first and economy. South African Airways first commercial flight using a 707 was in October of 1960 between Johannesburg and London. Although the aircraft didn't have the range to fly direct, it reduced the actual flying time to just 13 hours. The 707 replaced the DC7B on the Australian route and by the late sixties, the 707 was the backbone of the long-range fleet. In 1969, the 707 brought South Africans closer to America, operating a flight from Johannesburg to New York via Rio de Janeiro. At some point in the mid-sixties, the decision was taken to re-register the 707 aircraft. All SAA aircraft would, as is still the case today, have "S" as the first letter of the registration and the second letter would denote the aircraft type. South African Airways operated a total of ten 707s over the years. The last two, by then, used as freighters, were sold in October 1982. In the mid-sixties, SAA continued its commitment to jet airliners, introducing the Boeing 727 on regional and domestic routes. The 727 was a three-engined aircraft, having an engine on each side of the rear fuselage and the third in the tail centre section. It had a distinctive "high tail" with the horizontal tail surfaces on the top of the vertical stabilizer. As an aircraft with exceptional low speed take-off and landing performance, it was ideal for domestic routes. It could be operated in and out of regional airfields with shorter runways. Passengers were now able to enjoy the comfort and speed of jet travel on the shorter domestic routes. The first SAA 727 was registered ZS-SBA and was named "Tugela". It arrived in South African in June 1965 and remained in service with the airline until June 1982. The 727 was a popular aircraft with passengers and to this day, the pilots who flew them rate the 727 as the best airliner they have ever piloted. Towards the end of the sixties, in 1968, SAA introduced the smaller Boeing 737 to complement the 727s on domestic routes. The 737 was the final nail in the coffin of propeller driven airliners. The 737 is the most popular airliner ever made. A Boeing 737 either lands or takes off, somewhere in the world, every 5 seconds. To this day, a later variant of the legendary 737, the dash 800, is still the operated by South African Airways. The 1970s saw the introduction of the Boeing 747, the first wide-body airliner which earned it the nickname "Jumbo Jet". The first Boeing 747 to arrive at SAA was registered ZS-SAN and named "Lebombo", this aircraft now belongs to the South African Airways Museum Society www.saamuseum.co.za and can be seen at the museum facilities at Rand Airport. During the 1970s SAA opened a route to Hong Kong. From here on, South African Airways was now servicing every continent on the globe, except Antarctica. South African Airways has continued to grow and was once one of the world's most respected airlines. In 1994 a new government came to power and changed literally everything. 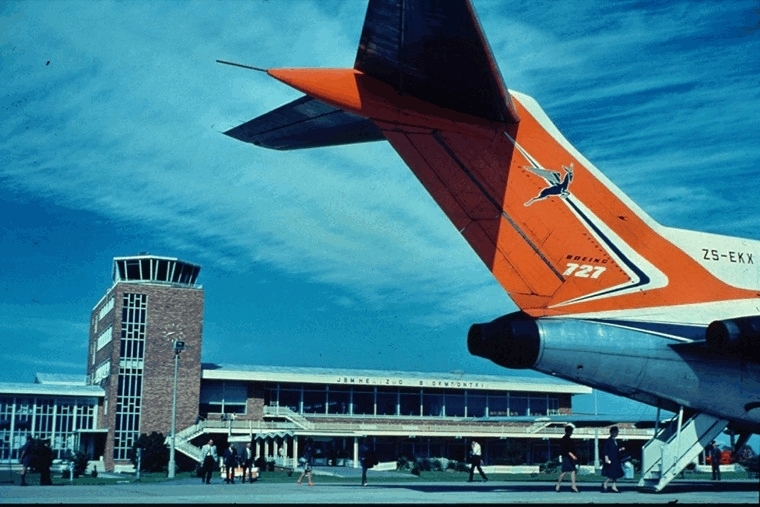 The livery was changed as somehow the orange tail was perceived to be a symbol of apartheid. Management were appointed for political reasons, often totally incompetent and the airline became just another feeding trough for government cronies and girlfriends of the president. Bad management, unreasonable unions and a number of other factors has dragged the airline down to the sorry state it is in now.